The U.S. auto industry is a very important economic driver. Sales have risen for eight straight years, last year setting a new record of 17.55 million vehicles. Much of what the Federal Reserve sees as an economic recovery is really the upturn in the car industry since the bailout of GM in 2009. How can this be bad? Lenders get sloppy. Consumers borrow too much. Manufacturers expand too much. That’s where the problems begin. Regular recessions are good for business because they encourage healthy pruning before excesses get out of hand. Thanks to the Fed, we don’t get recessions; instead we get record low interest rates which encourage excesses all the way down the line, from parts producers to dealers to lenders to consumers. In 2001-4, the Fed avoided a recession after the collapse of the tech industry boom by financing a housing boom. When the housing boom collapsed, the Fed tried to get out of the Great Recession that followed by financing a consumer boom with even lower interest rates. Unfortunately, wages did not respond, but borrowing did and the car industry took off in a tsunami of debt. Now we are getting the inevitable aftermath. 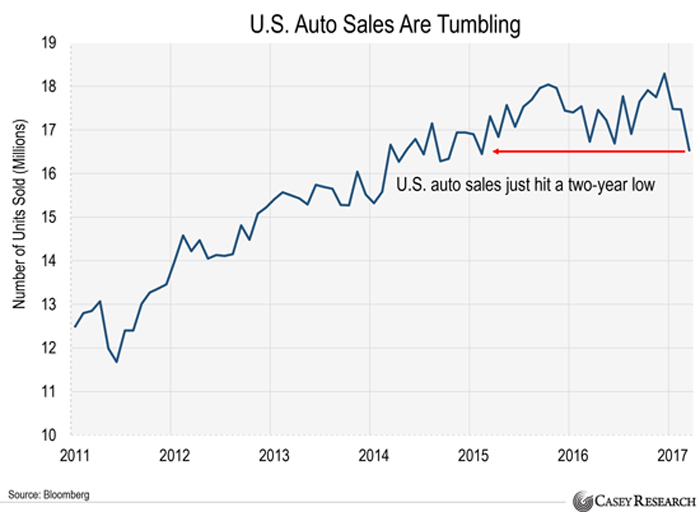 U.S. auto sales are plummeting. Here’s the evidence. Last month was actually the worst month for U.S. auto sales in two years. Sales are down 10% since the start of the year, the biggest three-month decline since 2009 when the U.S. was in its worst economic downturn since the Great Depression. This may not sound too bad on its own, but wait for the consequences. U.S. carmakers have slashed production. This chart shows how many vehicles the U.S. auto industry manufactures each month. In January of this year, the industry manufactured 18% fewer cars than it did in January 2016. 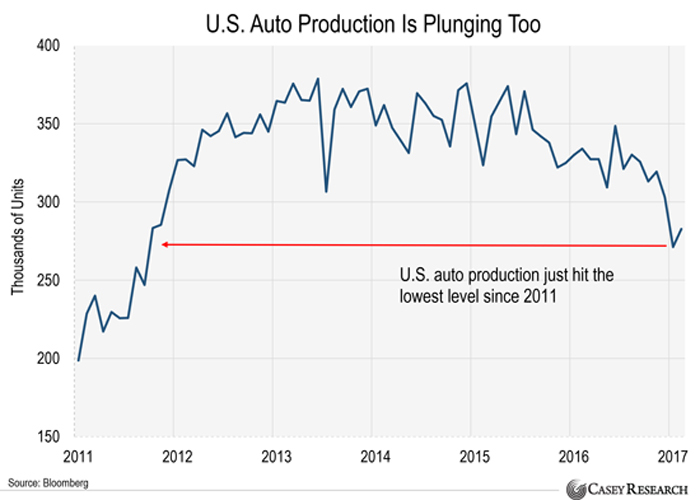 That’s the biggest year-over-year decline in domestic auto production since September 2009. But the cutbacks have come too late. 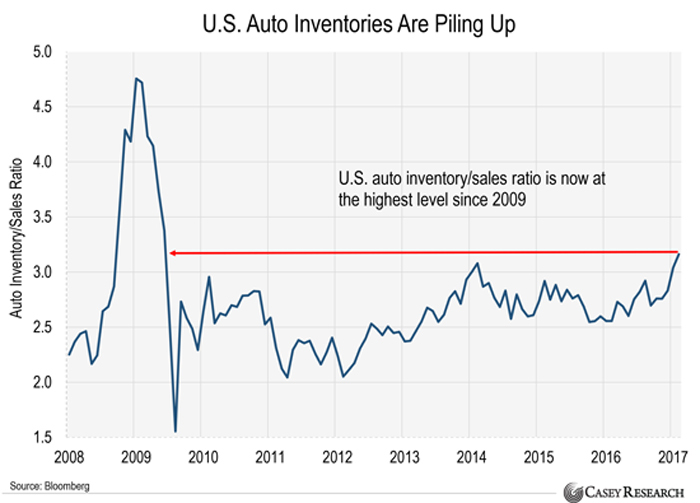 U.S. auto inventory levels are soaring. This ratio has surged higher over the last few months and it’s now at its highest level since the 2008–2009 financial crisis despite record levels of incentives to get consumers to buy. The auto industry is closely tied to the health of the economy and the stock market. This next chart compares the S&P 500 (green line) with monthly U.S. auto sales (blue line). These two lines have moved in parallel since 2010. This relationship has now broken down. 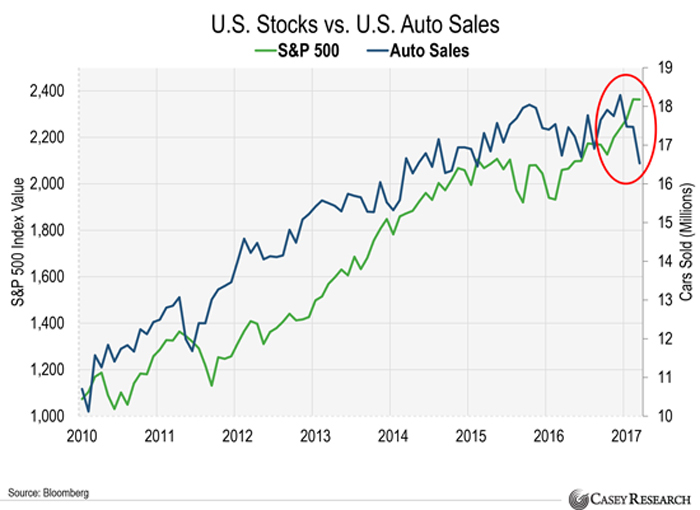 Auto sales are tanking but the stock market keeps rising. For how long? The auto industry is telling us that the economy is headed for trouble. The slowdown in this industry has an impact on the economy as a whole. But it’s more than that. The fact that consumers are buying fewer vehicles tells us that there are already problems in the economy that will show up elsewhere, including the stock market. You have been warned. Previous Previous post: Pensions: Do You Know Where Your Retirement Is?